Question: What are Zombies? Zombies are undead human corpses that shamble around eating and infecting other living humans. Purpose: the purpose of zombies is to eat, eat brains and human flesh... that's about it actually. 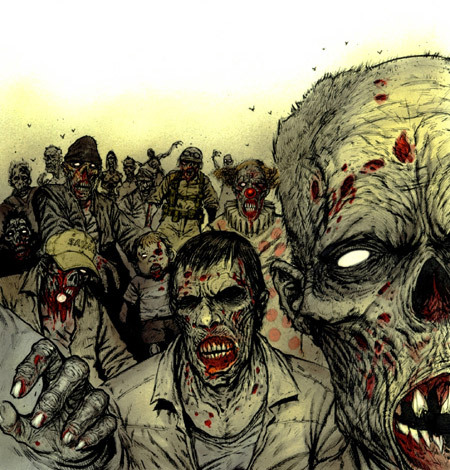 In the Point of View of the living, zombies are rotting monsters that can destroy our civilization and eat our brains and infect other humans. From the point of view of zombies, the world is a buffet and we are the main course. Of the many assumptions we have about zombies one is that they will either be slow stumbling zombies or really fast zombies, they spread their infection through a bite or blood, and that even though they are rotting corpses they are good at climbing over objects and not falling apart like you would expect a rotted piece of meat to do. The consequences of zombies I would hope are fairly obvious. Consequences include: becoming a zombie, being eaten alive, seeing your family and friends eaten alive or become zombies, being eaten alive by your family or friends, being turned into a zombie by your family or friends, eating your family and friends alive or turning them into zombies, and last but not least the end of the world as we know it. What to do in the case of a zombie outbreak? There are many options available, the quickest one is to sacrifice yourself to the zombies, however if you want to live this would not be advisable. You could stockpile weapons and food and hold out in your house, military base, hospital, local pub, etc. You could find a plane, fly to a tropical island form a new society with you as king and hope zombies don't learn to swim or fly. You could go shopping at a mall or go to an amusement park but this won't really help you survive either. Generally no matter what the likelihood of survival is low. However if you go down in a fit of glory surrounded by dead corpses of undead corpses killed by your cricket bat or machine gun then you can die happy knowing your death would have made an excellent movie. Interesting ideas for escaping zombies should they ever take over. I particularly like the one about flying to an island to survive. I think zombies are awesome. I think that sacrificing yourself to zombies should not be an option because you obviously do die like you said. I think that it would be pretty ok to have a zombie apocalypse so long as I own a plane. I am glad zombies are pseudoscience and do not really exist. As a Resident Evil game fan, I thank you for writing this post. Although they are surprisingly hardy for rotting flesh, the important thing to remember is that, when you are fighting zombies, shoot them in the head. Otherwise you will waste all of your bullets. Code Veronica X perfectly demonstrates a situation in which you kill zombies only to survive yourself.